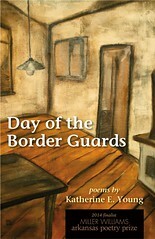 Day of the Border Guards: Poems by Katherine E. Young. University of Arkansas Press poetry series. The University of Arkansas Press, 2014, ISBN 1557286558, 63 pages. Paperback, $16.95. Katherine E. Young is a fine poet, no doubt about that; this collection is well worth reading. What makes a good poet is not so much what the poet writes about, but how she writes. Content is important, but expression, the interesting use of language and imagery, must be primary, otherwise the poet should be writing essays, and not poems. Young knows this well — many contemporary poets don’t. She has a very good ear for the sound, the musicality of poetry. She doesn’t make this at all obvious; the music seems to hide behind what she is writing about, which makes it all the more effective, due to its, albeit muted, persistence. It is background music in the very best sense of that term. Gone are the days when poets wrote music and rhythm that towered over content, such as in these lines of Wallace Stevens: “Chieftain Iffucan of Azcan in caftan/ Of tan and henna hackles, halt!” In the best modern poetry, the poet does indeed say something which most often can also be expressed in prose —try writing a prose summary of the Stevens lines — but expresses that something with an ear for the music of words and an eye for imagery. That’s precisely why it is poetry and not prose. This stanza — there are many such examples throughout the book — evinces a high degree of technical wizardry. The musicality of the language pleases the ear, without it ever being obtrusive. It serves the meaning; without it the content would sound very flat. Notice the alliteration and assonance of regilded, restored, and recartooned. Notice the counter melody of Hell, wall, and bells and the lovely assonances of tongues, hung, and Redemption. The soft “whisper” followed by the emphatic “Redemption” sums up her style for me. It is understated, a “whisper,” yet packs a wallop, “Redemption.” How well those last two words read in the poem–the rhythm is perfect. Not many poets can do this, and, unfortunately, not all readers notice. We’ve already discussed Young’s musicality. Although her language talent is readily apparent in this poem, I would like to focus on two other aspects: imagery, and, especially, control. As Emily Dickinson wrote, “Tell all the truth but tell it slant” — the poet should avoid being too direct or too abstract; a poem needs diamonds (music, imagery, control) and should avoid clumps of coal — fat, prosaic blobs of unadorned meaning. The control in this poem is remarkable. In some of the best poems, the meaning of the poem is not apparent until the ending. Unlike much prose, a good poem must be read many times and taken apart in order to savor and fully appreciate its beauty. Such is the case of this poem. We really don’t know what is going on in this poem until the end. The theme of the poem is a sorrowful parting from a friend — or lover, it doesn’t matter — with whom the narrator had a profound relationship. The images, all connected to the theme of the poem, pile up, gathering tension and momentum as the poem progresses, although we are still unaware of where they are leading us until the end. It starts out with the somewhat neutral image of gathering snow; it is followed by “the squeal of teeth/shearing steel” in the distance, and “The ashy scent/ of solder riding the air.” At this point, the reader knows that this is going to be a somber poem; the images all refer to a hostile, unpleasant environment. We are then confronted by the image of a crow scolding two people below. It’s as if the entire macrocosm is mocking the microcosm of the two individuals, who, perhaps, thought that their deep relationship could last. The image of the “tin-tipped solstice sun” is admirable. We know what clouds with silver linings portend, “tin-tipped” is more ambiguous. The tin periphery might be ominous, but the core of the sun is still bright. Young is probably referring to the spring solstice; perhaps this is a subtle indication that life will go on, and that even better times might be coming, despite this difficult parting. The climax of the poem is in italics. It is “too faint for an echo” — the compliment is dwarfed by a hostile environment. Obviously, the world is not telling the narrator that she is fine — quite the opposite; it is telling her that her emotions mean little in a hostile world. After this, the poet uses mechanical images, turnstile, platforms, tracks. No one else is mentioned, thus emphasizing the importance of and the loneliness of the two good friends. The image of the empty seat next to her says it all. The train must take her away — the narrator has promises to keep and miles to go before she sleeps. The solstice sun indicates that despite the sorrow of parting, life, like the train, will go on. All the images are simultaneously objective and subjective; they describe reality, but it is always a felt reality; they are objective descriptions of the narrator’s state of mind. This “felt imagery” is analogous to the use of free indirect speech in a novel; its use here increases the subtlety and the aesthetic pleasure of the poem. This poem is a stellar example of poetic craft. The unifying theme of the collection is impressions of Russia and her culture. Young, who translates Russian poetry and prose, and has visited Russia many times, sometimes for lengthy stays, knows the country and its culture well. The Russian context of the poems provides an additional plus for the reader, who, less familiar with things Russian, gets a vivid idea of the country and culture as depicted by a fine poet. Other critics have emphasized the Russian context. I decided to concentrate on what makes Young a good poet and not where she has been or what she is thinking about — the latter being a worthy topic of discussion, no doubt. But what makes Young a good poet might have been as readily apparent if she lived and wrote from, say, Newark. Not every poem in the collection is a gem, of course, which is the case of just about all collections. A poet should be judged at her best. This collection contains many fine example of Young at her best, and should be read by everyone who has an interest in poetry. Katherine E. Young’s translations of Russian poet Inna Kabysh were awarded a share of the 2011 Joseph Brodsky-Stephen Spender Prize and commended by the judges of the 2012 Brodsky-Spender Prize: a dual-language edition of Kabysh’s poetry for the iPad is forthcoming from Artist’s Proof Editions. Young’s translations of Vladimir Kornilov appear in Russian Poetry from Pushkin to Brodsky (Penguin Classics, forthcoming). Day of the Border Guards, a book of Ms. Young’s original poems, was published in 2014 by the University of Arkansas Miller Williams award series. She has a website at http://katherine-young-poet.com/. Thomas Dorsett is a poet and pediatrician. Hundreds of his poems have appeared in literary journals over the past four decades. His current project is the publication of a translation entitled “Letters Home,” a collection of letters from 1909 to 1914 written by a young Jewish Austrian musician, who died at the age of twenty-eight in one of the first battles of World War I.